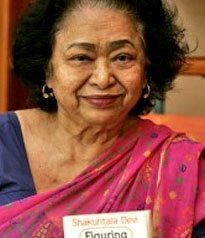 Shakuntala Devi was born on November 4, 1939 in Bangalore, India. In Dallas she competed with a computer to see who give the cube root of 188138517 faster, she won. In 1977 At university of USA she was asked to give mentally the 23rd root of 91674867692003915809866092758538016248310668014430862240712651642793465704086709659 32792057674808067900227830163549248523803357453169351119035965775473400756818688305 620821016129132845564895780158806771 (201-digit number). She answered in 50seconds. The answer is 546372891. It took a UNIVAC 1108 computer, full one minute and 2 seconds (10 seconds more) to confirm that she was right after it was fed with 13000 instructions. On June 18, 1980 she demonstrated the multiplication of two 13-digit numbers 7,686,369,774,870 x 2,465,099,745,779 picked at random by the Computer Department of Imperial College, London. She answered the question in 28 seconds. Her correct answer was 18,947,668,177,995,426,462,773,730. This event is mentioned on page 26 of the 1995 Guinness Book of Records. Now she is known to be Human Computer.